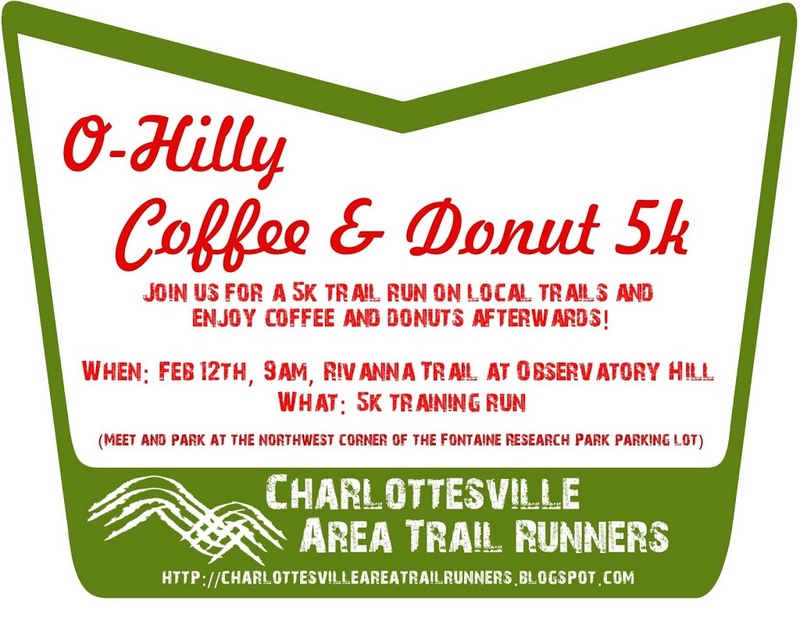 CATs and other runners interested in trail running: We are hosting a super-fun training run at Observatory Hill in Charlottesville on Sunday, February 12th at 9 am. The run will start from the northwest corner of Fontaine Research Park parking lot (located near Rte. 29 and I-64, see here) and follow a winding path of ups and downs on the trails of “O-Hill”. Running at O-Hill can be lots of fun and good training for mountain runs. To assure that nobody gets left behind, the course will be marked with ribbons and we will group together at the start in fast, medium and slower groups. 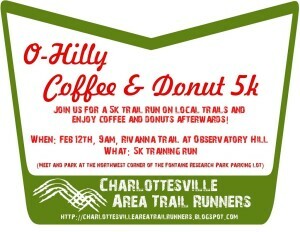 This run is perfect for first time trail runners and for CAT runners that haven’t run long trail distances for awhile. Upon finishing up back at the Fontaine parking lot, we will have warm coffee and donuts awaiting runners. Our hope is to have everybody hang out so that we can get to know each other better. (Holiday Lake runners, who will have just finished up their 50K+ run the day before can join for a recovery run and/or coffee and donuts with the other runners). Come join us on Sunday, February 12th at 9 am. For head count purposes, please RSVP to David (dcs8f@virginia.edu) or to the event on the CAT Facebook page. What a great idea, cant wait to meet a lot of the runners we never get to see on the long mountain runs!!!! I will be running Holiday Lake the day before so i dont mind running with a less fast group, or even staying in the parking lot and setting things up. Great, looking forward to have you over on the sunny side of the mountains! Wow, now you’re talking! Alas, I’ll be water skiing and drinking vino on the 12th in S. America so I’ll have to catch the next one.